Spring has sprung in the Smokies! It’s time to dust off those winter clothes, lace up those hiking shoes, and get ready to explore and relax in the Great Smoky Mountains! Family vacation, romantic couple’s weekend, retreat, reunion, week away with friends…whatever you’re planning, we have the cabins for YOU! Located in the Bear Creek Crossing Resort of Pigeon Forge, Tennessee, Hilltop Plunge is convenient to Pigeon Forge and boasts community amenities, including indoor and outdoor pools and a miniature golf course! At the cabin, enjoy a private indoor pool, lodge-like interior design, an open kitchen with stainless-steel appliances, and a game loft with arcade games, bunk beds, and shuffleboard and foosball tables! You can soak away in the outdoor hot tub, cozy up in front of the fireplace in the living room, or flip on the TV with Blu-ray player for movie night. This stylish, spacious cabin is great for group getaways! Wooded and mountain views from the hot tub on the screened-in deck, homemade meals in the rustic yet modern kitchen, pool and arcade games in the loft, grilling on the deck, cozy nights by the stacked-stone fireplace…this charming Pigeon Forge cabin has all the ingredients for a perfect retreat in the Great Smoky Mountains. It’s just minutes from the Parkway, so it’s easy to explore downtown, but it still features peaceful tree-studded and mountain views! The amenities – king-size beds, TVs in the bedrooms, a pool table, high-speed internet, a dual gas/charcoal grill, and more – just go on and on! 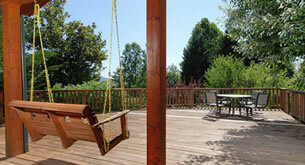 In the Condo Villas community in Gatlinburg, Tennessee, Smokies Hideaway is bringing NEW spaces to you! This new-construction cabin will feature king-size beds, mountain views, wireless internet, a big screen TV, board games, TVs in the bedrooms, a washer/dryer and fully equipped kitchen, a soothing outdoor hot tub, a grill, a DVD player, and community pool access! You’ll find fun, relaxation, and good times with family and friends at this brand-new cabin in the Smokies! Spring brings so many fun things to the Smokies! Once you’ve checked out our new cabins (and decided which one YOU want for your next vacay), see what’s happening in the area!